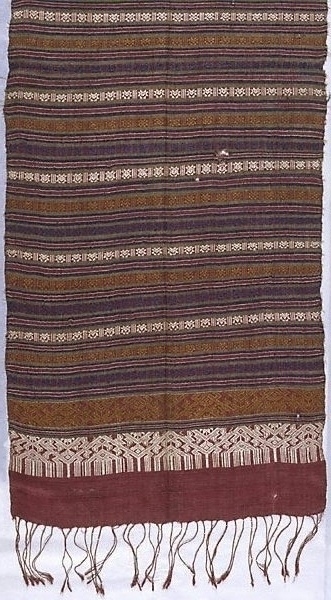 This shawl ('phaa biang') is woven with a banded design of white, yellow, blue and green supplementary weft weaving on a red silk ground. The ends are decorated with bands of highly stylised river dragons ('ngueak'), although more recently they have been called 'naak' (mythical serpent). The centre of the cloth is decorated with a pattern of stripes alternating with an eight-pointed star motif and half diamonds with stylised floral designs. The style of the piece indicates that it is a Muang Phuan type. Lao-Tai women wrap phaa biang cloths around one shoulder and the torso. These cloths are also used for healing practices ('phaa sabai'), as head wraps ('phaa khan soeng'), and as shoulder cloths ('phaa phai'). As a curative cloth, the textile was believed to be powerful enough to help the healing process through its combination of colours and motifs.